Do you know those motivational posters folks hang up in their offices that say things like “ACHIEVEMENT” or “COURAGE”? Well, this edition of the minimal art from the Bible taken from the site, Being RKP, could have hung on the walls of the people in Numbers. What are we doing in the desert? What is all this wandering for? Then they look at this poster and buck up. It’s an Israelite motivational tool. As hokey as those posters can get, it is good to be reminded of our purpose and our goals. We should not walk aimlessly through life, but should always hold before us the hope that we have in Christ and seek to be obedient to his call upon our lives. The Israelites lose sight of goals and of their past, and in so doing are tossed about by the influences of the nations surrounding them. Did Christ Go Up Up and Away? 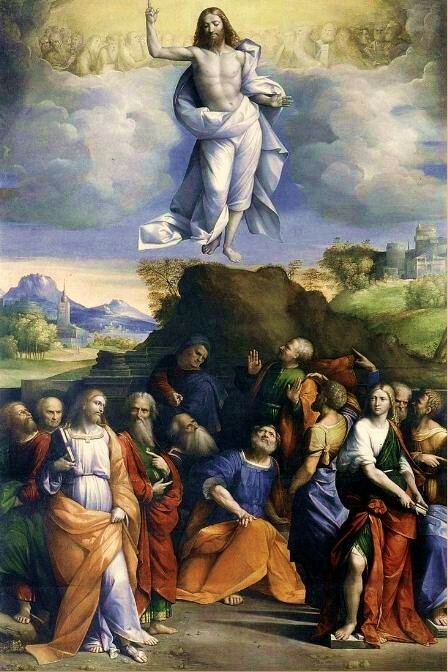 In the end of Luke and in the beginning of Acts we read about the ascension of Christ. 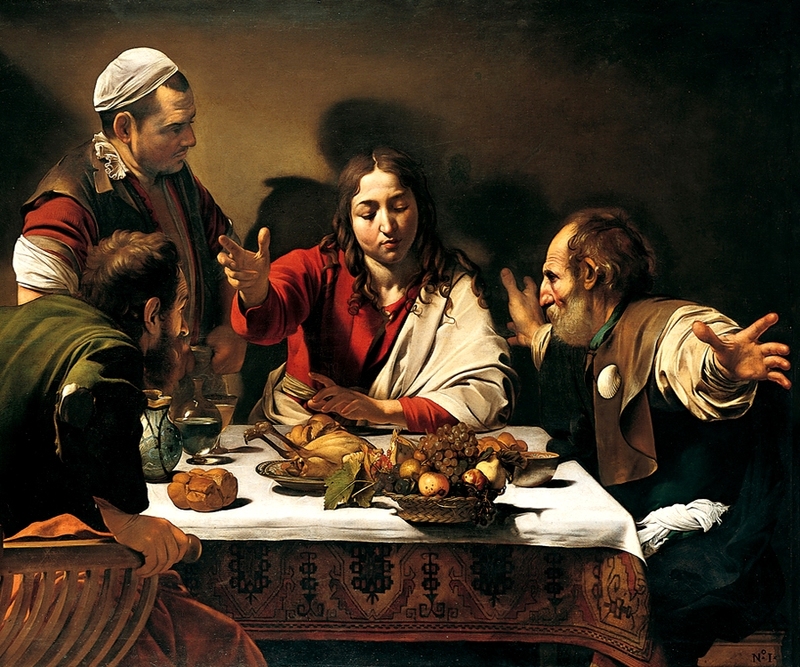 This short article from the site Near Emmaus raises some questions about what occurred that day and makes you think about where heaven is. Jesus didn’t keep going into space, past Jupiter, to some floating New Jerusalem a few miles past Neptune. Rather, Jesus disappeared into a parallel reality, yet God accomplished this in a way that would have conveyed symbolic meaning to the disciples. 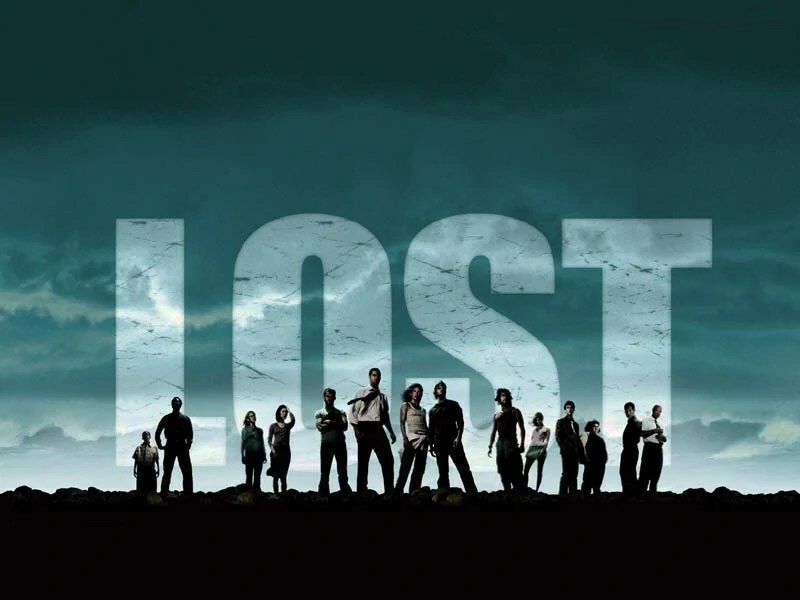 The Israelites were LOST for 40 years.  The judgment on the Israelites for their fear and disobedience in regards to entering the promised land was that they’d wander in the desert for forty years. No one of that generation would see that abundant land, none but Caleb and Joshua. Instead it would be for the next generation to take possession of it for themselves. We read through this wandering in the second half of Numbers, watching how the old guard makes way for the new. This may be a bit of review of last week, but this question came to mind this morning in a small group Bible study I’m in: What would you have said to the people to convince them to follow God and go into the promised land? If you were Caleb and Joshua, the two spies who trusted God’s provision, what would you have said to the people? 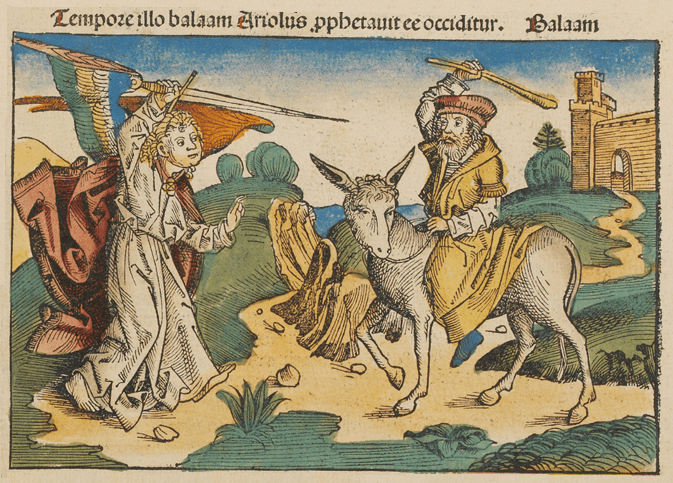 How could you have tried to help Israel avoid the wandering we see in this week’s readings? I think the way we answer that will also help us to know how to speak to fear in our own lives. How do we encourage trust in God in the face of fear? How do we follow when the road seems hard? These are the questions for Israel, and they are questions for today. I’d love to hear in the comments or via email what you would say if you were Caleb or Joshua. If you ever get a chance to do a book review for a new book that claims to know the date of Christ’s return (note that old books on this topic have a hard time remaining in publication after having been wrong), do so. I think it’ll be an easy job. They’re wrong. We see Christ speak about knowing the future in chapter one in Acts, and it comes up elsewhere, too. There may be general signs and indications that the end is nearing, but no one knows when that will be. It is not just that we’re ignorant, it is a willful ignorance willed by the Father. When people ask Jesus before he ascends in Acts 1, “Lord, will you at this time restore the kingdom of Israel?”, Jesus makes it clear we’re not supposed to know. He says, “It’s not for you to know times or seasons that the Father has fixed by his own authority.” This is not to be our concern, but I do find it comforting that Jesus next statement regards the Holy Spirit. We can be an anxious and curious people, and to help us in our frustrations of knowing what to do and what comes next, Christ promises his Spirit. We know how the story ends. We know the last chapter. But there is a lot left unknown to us, and it is not our place to speculate. We trust the future God has in store for us, doing so by the power of the Spirit, and we certainly welcome the day, whenever it is, of Christ’s return when he will restore his kingdom and make all things new. 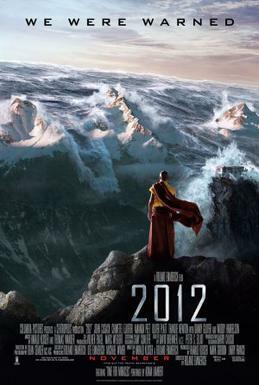 And I’m pretty sure that it won’t be December 21, 2012. We’re back to just reading two books this week as the Psalms are taking a week off. But in its place we have another hearty week of Numbers and seven chapters of Acts. In Numbers we have some well known stories like when Moses brought forth water from a rock, a bronze snake that heals the Israelite people, and a donkey that talks. We finish this week as the Israelites come to the end of their wandering and are readying themselves to enter the promised land (again). Acts is a continuation of Luke, written by the same author, continuing the story of what happens once Jesus is raised. It is often described as Acts of the Holy Spirit, and that is what it is. You’ll see the way that God’s Spirit empowers the early church and the disciples to spread the gospel of Jesus Christ. We’ll read about Pentecost, healings, opposition from the Jewish establishment, and Stephen’s wonderful testimony before the Sanhedrin and subsequent stoning. Stephen is considered the first Christian martyr. Hope you enjoy this week. If you have questions or comments, send them this way and I’ll do my best to respond and share with everyone else. I’d love to have you join me this summer at either reading groups, which you can find more information about at the above link. Some things take breaks as school is out in the summer, but you can always find yourself welcome at a reading group. 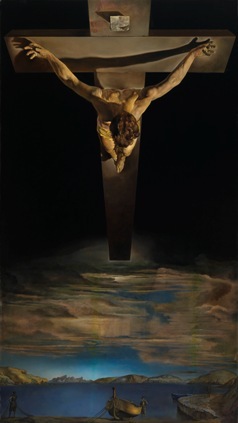 Christ of Saint John of the Cross by Salvador Dalí, 1951. God has a special claim among his people of the first born. Then in Numbers 3 he makes an arrangement that I’m sure the tribes were happy about. Instead of having to give over their own firstborns, all the tribes will be represented by the Levites. They will consecrated to the Lord in the place of the children of the rest of Israel. But this is not the only stand in we see in God’s story. Jesus is arrested and accused of crimes he did not commit. He alone in history is the true innocent one. Yet, in Luke 23, when the people call for someone to be pardoned they cry out for Barabbas. They cry out, “Crucify” to the innocent, and demand release for the guilty. We can see ourselves in this story, taking the place of Barabbas. We are the guilty ones who deserve the punishment standing beside the innocent Jesus. But we receive the pardon because of Christ’s sacrifice. It is as though God says, “Take my own firstborn instead of these people who deserve the consequences of their sin.” Christ suffers the punishment that we deserve and stands in on behalf of God’s people. Because of this substitution sinners are forgiven and are reconciled to God. Having completed such a work in Christ, we now press on to read in Acts, and we will see what God will do to care for and grow his church once Jesus has left the people. It is a church made possible only because of the life, death, and resurrection of Christ, who stands in on our behalf. An approach that I take when reading Scripture rests on verses like this one. Yes, there is an Old and New Testament, but there is one Bible. One Bible that reveals to us who God is, and that revelation is seen most clearly in Jesus Christ. It is not only permissible for us to read sections of the Bible that are not explicitly about Jesus and to see him there, but it is necessary to fully understanding Scripture. In Luke 24, Jesus is on the road with two men who do not understand that Jesus had to die to fulfill God’s Word. They say, “We had hoped that he was the one to redeem Israel.” They had hoped. But because they did not understand Scripture they in turn do not understand Jesus and what he came to do. Jesus says they are foolish and are slow to believe all the prophets spoke because the prophets spoke of himself. Jesus Christ is the center of our faith and he is revealed throughout all of Scripture.